1. Identify two weaknesses of the Articles of Confederation. A) If someone is given the power to do something, they should also be given the means of doing it. "Under the Articles of Confederation, Congress was given the power to declare war, raise an army and navy, make commercial treaties, borrow money, control currency, and levy assessments against the states." However, by withholding the power of imposing taxing Congress had many worthless tools. They couldn't raise an army or a navy without money - and they couldn't declare war without armies and a navy. B) "The Articles of Confederation created a very weak national government, with the states retaining most of the power for themselves." If the states have majority power, then how is the government supposed to keep order? This system could lead to disaster. The government would have no power one of the states decided to go to war with another. This could lead to the destruction of the country. Point A is good, but Point B is less persuasive. I don't think war between the states was a realistic fear then. (Minus 1). 2. Identify the first three Articles of the Constitution, and what each Article establishes. I. Grants power to the Legislative Branch, or Congress. II. Gives power to the president. III. Gives power to the Judiciary Branch, or Supreme Court. 3. Explain what you like most about George Washington. George Washington was great. I believe that, aside from the fact that he was our first president, he is respected and loved because no matter how hard and seemingly impossible a task got, he always pulled through and never gave up. 4. Describe the most important invention of the 1790s, and its political impact. Invented by Eli Whitney in 1793, the cotton gin is the most important invention because it did the backbreaking, extremely difficult job of separating cotton from the thorny branches and seeds. It transformed the South into the greatest cotton producers in the world - becoming the #1 source for cotton. The South though themselves invincible and even called themselves "King Cotton" - until their defeat in the Civil War. 5. Explain the political view expressed by this week's cartoon, and which side of what issue the cartoonist likely represents. I believe it describes the ratification of the Constitution by the colonies. At the time of this cartoon, Delaware, Pennsylvania, New Jersey, Georgia, and Connecticut had already ratified the Constitution. Massachusetts was on the verge of ratifying so I believe the hand could possibly be God, since it is reaching from the clouds or just a way of showing that Massachusetts was nearly joining the rank of those who ratified already. Massachusetts ratified the United States Constitution on February 6, 1788, by a vote of 187 to 168. 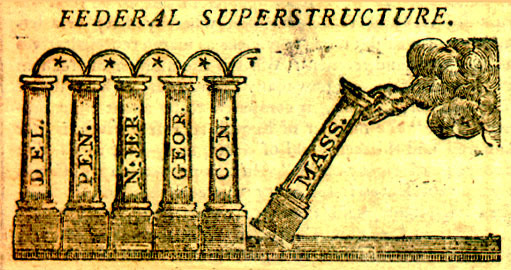 A later cartoon, publicized 10 days later, depicts Massachusetts standing with the rest of the States. The cartoonist was probably a Federalist because he depicts a hand, possibly Gods, holding the states together. 6. Describe two significant achievements of The Northwest Ordinance. The Northwest Ordinance created a three-stage process depending on how many citizens a territory had to have before becoming a state. It also established protection of properties and the individual rights of the territories citizens. 7. Describe what you think was most significant about John Adams' presidency. I believe that the most significant act of John Adams' presidency was the signing of the Alien and Sedition Acts. Aside from the sole reason to weaken the Democratic-Republican Party, the Sedition Act was a blatant invasion on the Bill of Rights. The First Amendment give citizen of the United States freedom speech and freedom of press, and the Sedition act went against these rights. Mr. Schlafly, I am very busy with other school work and have not gotten to honors questions this week. I may do them after class tomorrow if I have time and have you check them just to see if they are correct. (no credit because they would be late - I would be doing them only for my benefit). This page was last modified on 28 November 2008, at 10:05.